Somehow we managed to make our morning town break last 2.5 hours. We only had to buy one day of food. No rush. We finally walked out of Col de Mosses at 11:30. Most of the day was not anything particularly exciting. The climbing was a sweat fest because it was so humid. And all the views were partially hidden by thick haze. It kind of looks like smoke. Just before we got to Lac de l’Hongrin we saw 2 fisherman. He had caught a bag full of trout. He had on a shirt from Russian River, Alaska. 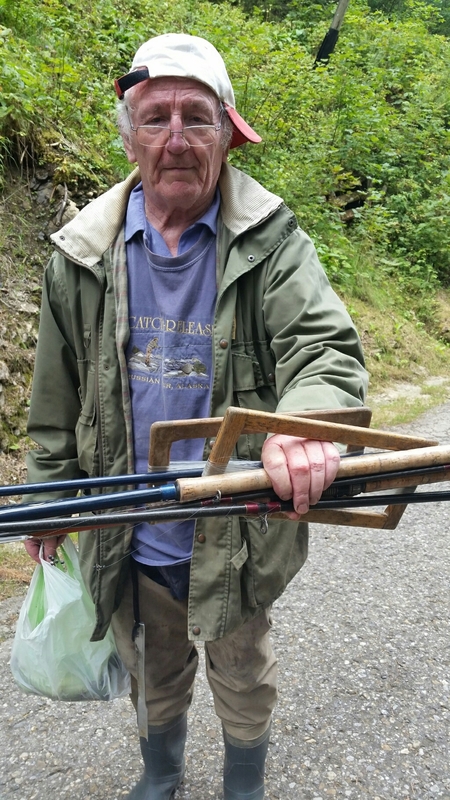 He told us he caught some huge salmon there. We think he said he got this reel in Alaska. It’s a rectangular piece of wood. Way too much of the day was spent walking on pavement. Its hard on the feet, knees and hips. But at least the miles go by faster. 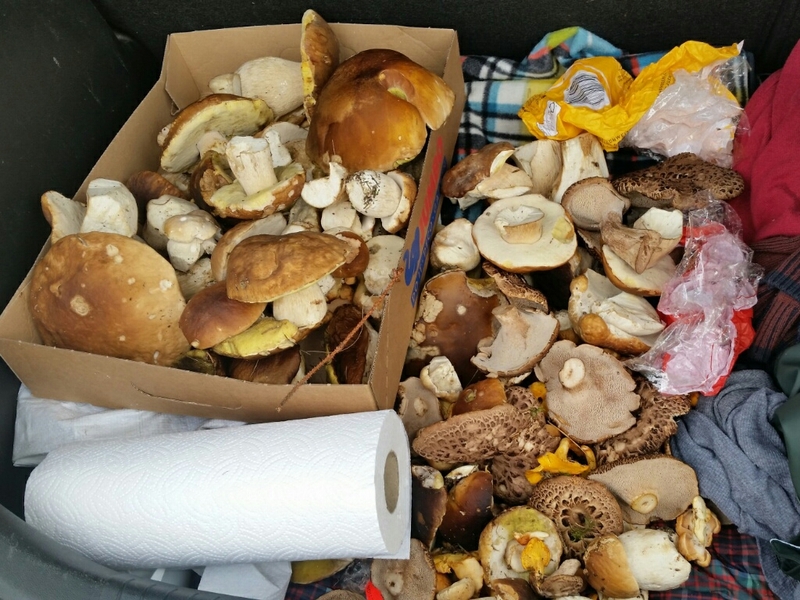 We saw a couple of very successful mushroom hunters. I have found 2 porcinis the last couple of days. I gave one away. We don’t have a stove so I couldn’t cook them. Dang. 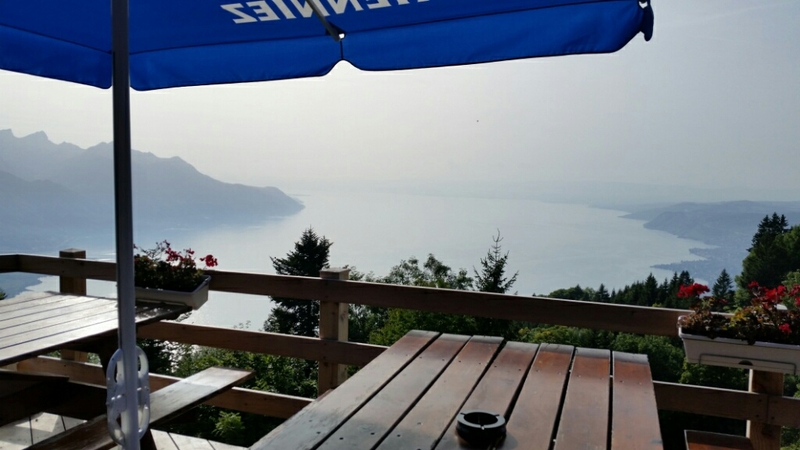 At Alp Chaude (1475m) we saw our first sign with Montreux, the end og the hike. We wanted to buy some cheese here but no one was around. 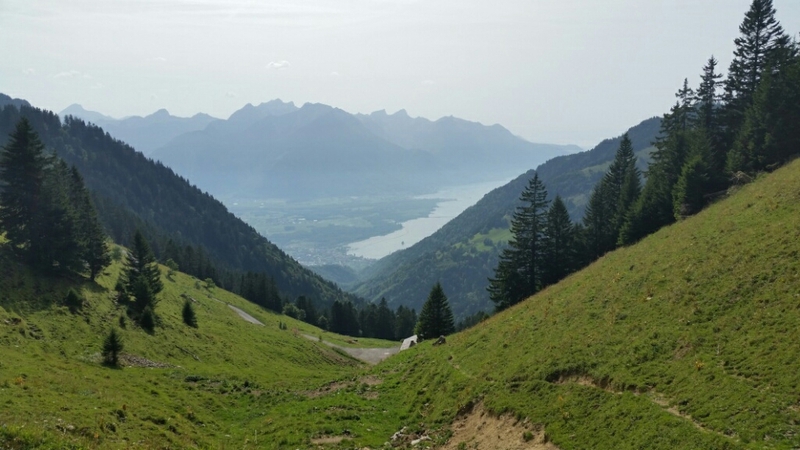 At Col de Chaude (1621m) we could see Lac Léman (Lake Geneva) more than 1200m below. That is the end of Alpine Pass Route and we will be there tomorrow morning. 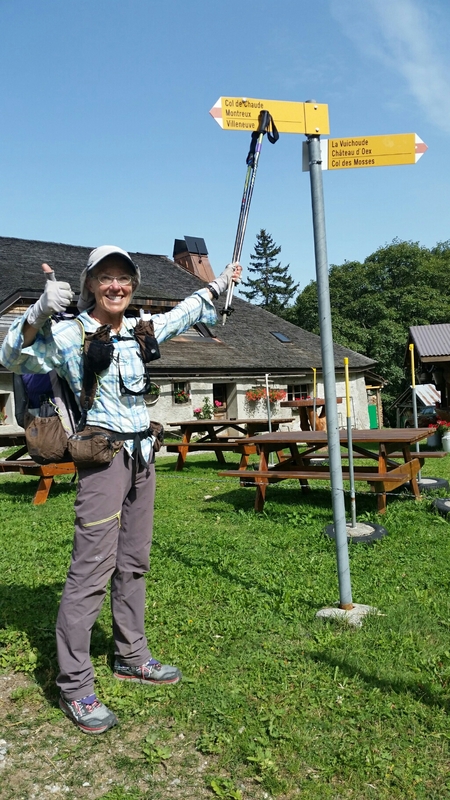 At Sonchaux (1261m) we stopped for a beer for Jim. The haze muted the view. Not all campsites can be 5 stars. Tonight we are sleeping by the side of a road. In gravel. But it’s flat, the road hasn’t had any traffic, it’s quiet, there is a view across the street, there is a picnic table and a garbage can. And most importantly it was there when we needed it. 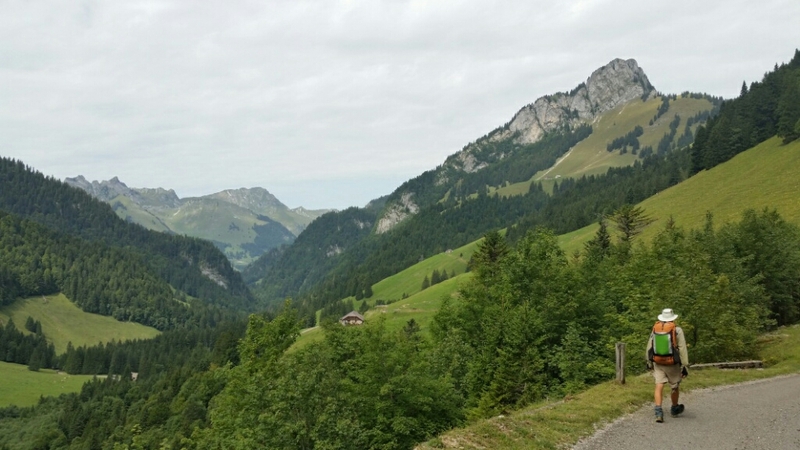 This entry was posted in SWISS ALPINE PASS ROUTE / VIA ALPINA 1 SWITZERLAND 2017 on August 28, 2017 by nancyhikes. Nice casual start to the day. I was awake til after 11 getting my blog updated. I needed the sleep.